It’s cold outside, but you can stay toasty warm this winter and save money, too. Ease the load on your furnace and the pinch on your purse. 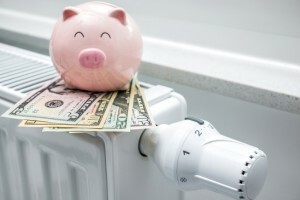 Take a tour of your home, inspect problem areas, and follow these 12 small steps to get big savings on your next heating bill. Let the Sun In – Open your curtains or blinds during the day, especially on the south side of your house. Despite the frigid, cold air outside, the sun’s rays will add brightness and warmth to your home and bones. In the evening, keep the heat inside by closing your window treatments. Get the most from nature’s free rays by trimming any overgrown bushes and trees around your windows. Remove Obstacles from Heating Vents – When decorating your living area, arrange furniture so that it doesn’t block a vent. If you place a sofa or dresser over a register, you’re preventing most of the warm air from blowing out. Reduce heating costs by removing any obstructions to heat flow. Insulate Your Home – Put a parka on your home by using insulation to reduce energy bills. It minimizes heat transfer in both the summer and winter and provides ventilation to control moisture. It’s especially important that your attic door is properly protected. If it’s warped and doesn’t lie flat, use adhesive to attach fiberglass batt insulation to the attic side. This will create a tight seal and keep warm air from escaping. Seal Ductwork – Inspect all ductwork accessible from your attic or basement. Check to see if there are any gaps in the seams or corners. If you find any, cover them using mastic sealant or metal tape. Replace Worn Weather Stripping – Check the weather stripping and caulking around windows and doors for tears and replace where needed. This inexpensive, easy-to-do repair will save you money and help keep you comfortable. Fix Drafts from Electrical Boxes – Electrical boxes on exterior walls are often drafty. To eliminate the leaks, watch this video to learn how to install a foam gasket over an outlet or switch. Install Plastic Film Covers Over Windows – Inexpensive film covers placed around windows and sliding patio doors are barely noticeable and will help to reduce heat loss. View this video to see how easy they are to install. Inflate a Chimney Balloon – Everyone loves the warmth and coziness a fireplace adds to a home, but the downside is that heat is always escaping, even when the flue is closed. To prevent this, view this video to learn how to place a balloon in the chimney. Post a sign on top of the mantel to remind everyone it’s there and remember to deflate and remove it when you want a fire. Upgrade the Thermostat – Programmable thermostats are now very affordable. For a modest investment, you can stop worrying about turning your heat down when you leave or sleep. By automatically dropping the temperature 10 degrees at night or during the work day you can drastically cut the cost of your bill. Buy a Portable Heater – When the entire household is gathered in the family room, turn down the furnace thermostat and use a space heater instead. Although the rest of the house will be cooler, you’ll be toasty warm and happy, especially since you’ll be enjoying the financial benefits of this heat savings tip. Eliminate Door Drafts – Keep the cold air out and the warm air in by placing a draft stopper on the floor at the bottom of the door. Also, adjust the threshold so that you can’t see daylight peeking through. Some doors have four or five screws that allow you to adjust the height to eliminate the gap by turning them counterclockwise. However, be careful that you don’t raise the door so high that it interferes with opening and closing or that it drags. This will wear out the weather stripping. Plug Holes in Exterior Walls – Remove the old cracked caulking around any pipes, gas lines and electrical cables that enter your house and reseal the gaps with expanding foam. Follow these tips to lower your heating bill and stay cozy this winter. And, don’t worry. The hibernation won’t last forever. Spring always comes.